At least 300 people are killed on an average every month. Many more maimed and missing. A generation rendered migrants. The 10 years have even robbed the Kashmiri of his capacity to cry. Now there is indifference to blood. Death is more familiar than life. And the semblance of normalcy that hovered on his horizon has vanished. Yet, the Indian government maintains that Kashmir is on the path to peace. "The locals don't support militancy anymore," officials tell you. "The situation has improved." Then how do you explain the recent wave of violence? The daring attacks on army camps? Heightened security operations? The recommendation to move in more troops by summer? How do you explain the overwhelming sense of alienation that still veils the valley? Hear what the Kashmiri says: "We still support militancy... A Kashmiri will never feel that he is an Indian. We will NEVER accept India." Is this the truth about Kashmir? December 8 marks 10 years since militants kidnapped then Union home minister Mufti Mohammad Sayeed's daughter, Rubaiya. 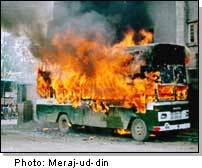 That incident is touted as the turning point in the Kashmir insurgency. rediff.com's Chindu Sreedharan presents a 10-part series on where the conflict stands and where it is headed. "There was no sympathy for Rubaiya. The people were all with the militants." Reliving that day 10 years ago.